For those with COPD, nutritious foods are vital to staying healthy, as a poor diet can cause difficulties when breathing. Your body uses the food you eat as fuel to function and do daily activities and without good food, your body can lack fuel. By eating the right nutritious foods, you provide your body with the fuel it needs to function properly. No individual food will provide you with all the nutrients your body needs, but with a mixed diet, the variety of food can provide everything you would need. Your medical team will likely discuss the importance of nutrition and help you determine a diet that will work for you. If that doesn’t seem like enough for you, try and meet with a registered dietitian nutritionist (RDN) to go over what you need and what foods you can get that from. When meeting with an RDN, include the foods you like eating, what foods you do not like eating, your exercise routine and any health/dietary issues you may have. Your body changes the food you eat into fuel to run your body, this is your metabolism. Your metabolism preforms a chemical process that breaks down food and turns it into useful fuel that helps the body function. Oxygen and food are consumed, and the body turns those materials into energy and carbon dioxide. Carbon dioxide is a waste product expelled by our bodies, we often exhale carbon dioxide. Weighting yourself is often associated as a negative thing, as many worry about the number on the scale, but it can do good. 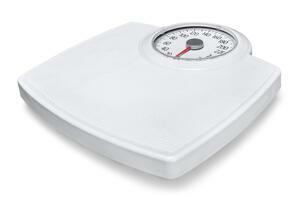 Regularly checking your weight can give way to any weight changes, including gaining or losing weight. Additional health complications can arise when an individual is underweight or overweight. A healthy body can also help fight off infections, which is very important for those with COPD. When picking foods, focusing on healthy alternative is very important. Complex carbohydrates are good for you (in quantity), these can include whole-grain breads, pasta, fresh fruits and fresh vegetables. If you are over your goal weight, focus on eating more fresh fruits and vegetables versus bread and pasta. If you need to gain weight, eating a variety of whole-grain carbohydrates on top of fresh fruits and vegetables can help. Carbohydrates that are not recommended are table sugar, candy, cake and soft drinks. These forms of carbohydrates are not digested regularly and often turn into fat in the body. Fiber should be limited to 20-30 grams each day, as too much fiber can prevent normally bodily function. Fibrous foods such as bread, pasta, nuts, seeds, fruits and vegetables are all great sources of fiber. Protein is also vital in a nutritious diet, as this help with muscle strength and in those with COPD muscle strength in the lungs may actually be weaker. Forms of good protein include milk, eggs, cheese, meat, fish, poultry, nuts, dried beans and peas. If you need to lose weight, eating low-fat sources of protein (lean meats and low-fat dairy) can help do that. Gaining weight will require higher fat content of foods, whole milks, whole fat cheese and whole fat yogurt. It is important to pick mono- and poly-unsaturated fats over other forms of fats (trans and saturated fats). Mono- and poly-saturated fats do not contain cholesterol and are found from plants versus produced. 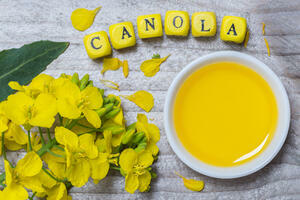 Fats such as canola, safflower and corn oils are all good options in order to reduce the amount of trans and saturated fats. If you need to lose weight, limit the amount of fats you intake (mono-, poly-, trans and saturated). If you need to gain weight, bring in more fats to your diet (only mono- and poly-unsaturated). Limit your intake of trans and saturated fats, which are butter, lard, fat, skin from meats, hydrogenated vegetable oils, shortening, fried foods, cookies, crackers and pastries. A lot of the population takes a multivitamin, but that might not be enough on its own. Many with COPD often take steroids to help with their lungs, but long-term steroid use can cause a need for more calcium. Taking a calcium supplement (with vitamin D) can help reduce the lack of calcium in the body. A high amount of sodium in the body can cause swelling (edema) in the body which can then increase blood pressure. If you have high blood pressure, speak with your doctor about the amount of sodium you should be having every day. You can also discuss this with your RDN about what herbs and spices you should be using instead. Drinking fluids is another key for those with COPD, as it can help thin and reduce the mucus in the body. You should also speak to your doctor about how much water you should be drinking every day. The average goal is to drink 6 to 8 glasses of water every day, over the course of the day. A good tool is to fill a pitcher of water (how much you are supposed to drink in a day) and continue to refill a glass of water until you drink it all. Healthy and caffeine-free drinks can count towards your daily fluid goal, but water should be your main source of fluid. You may have difficulty trying to meet your nutritional needs with the foods you eat every day, and it can be more difficult if you need a lot of calories. If you are unable to meet your nutritional needs, your doctor may recommend a liquid drink that is a supplement for your nutritional needs. For many with COPD, maintaining nutritional levels in the body can be difficult, it is possible that they don’t even know that their levels are too low or too high. When meeting with your doctor or RDN it is important to discuss how you feel on a daily basis (i.e. sluggish, tired or sore). Your daily feelings can help determine if you are lacking certain foods in your diet or if you may just need other supplements to help. 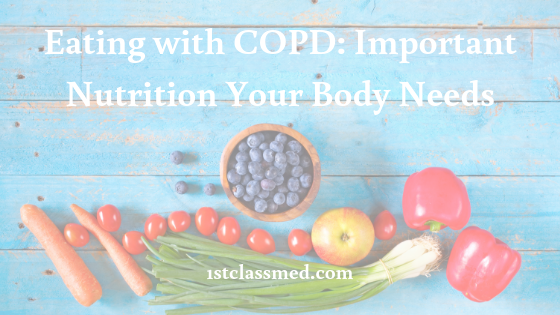 Nutrition is very important for those with COPD as it can play a role in how you feel daily, and it can help keep lung function at its highest. Shipping Anywhere In the U.S.
"1st Class Medical does not provide any Home Servicing of equipment"
© 2014 1st Class Medical Store. All Rights Reserved.